Phil Serrell and Kate Bliss race towards the finish line at the showdown auction in Southampton. Having spent £1000 across four different locations, who will come out on top? 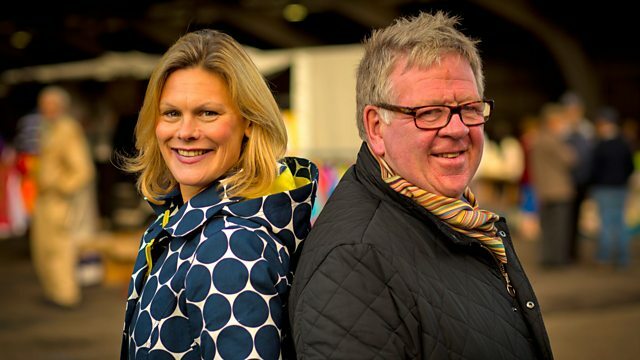 Browse content similar to Phil Serrell v Kate Bliss - Showdown. Check below for episodes and series from the same categories and more! And gives you the insider's view of the trade. battle our incredible experts have fought yet. to track down top treasures they can sell on for top dollar. Phil unleashes his inner wheeler-dealer. Del Boy! How are you? Drop the hammer, drop the hammer. Will you please wipe that smile off your face? Thank you. our dealers draw their swords in this ultimate duel. and the accolade of top dealer are the prizes at stake. First up is a savvy maiden with a shrewd eye for a bargain. I am determined to beat the Fox. and the moves of a stealth missile. Today's the day I need to take the band off the bundle. and any profit they make will go to a charity of their choice. But the Showdown has a twist. Auction, where our dealers have no control over the buying public. and watch as their items go under the hammer. Only one can be victorious. The other will have to do the walk of shame. So, Kate Bliss and Phil Serrell, may the odds ever be in your favour. It's time for the Put Your Money Where Your Mouth Is Showdown. -So this is it, the last challenge, the Showdown. "Put Your Money challenges. You have £1,000 to spend." "You can sell up to four items wherever you want. "in direct competition with your opponent. "..who makes the most profit. Good luck." Good luck to you, my friend. Let's get in there. It's Round 1, The Auction. So, what are they planning? again at auction doesn't usually mean a vast amount of profit. so I think I'm going to try and make those the less expensive items. pursuits with an estimate of £20 to £40. Bids in with me at £16. Is there £18? That's £16, a bid with me. £18, £20 with me, £22. I'm out at £22 in the room. Is there £5? £25 on the internet. £28, sir? £28 in the room. At £28 I am selling. so I think I bought that really rather cheaply. Now, it was published in 1935.
at that time and it's basically all about horseback pursuits. the fox normally always gets away. up to grab a collection of toy cars with a guide of £50 to £80. OK, this is the one I want. £70 I start, £75, £80, £85, £90, £95. £100, £110 on the screen. the estimate but Miss Bliss isn't giving up. -£150, another room bid at £150. That is far too much but I'm in at £160. £160. They are nice, though. They should be for double the estimate! is by selling them to different buyers. The racing cars to one person, maybe the aeroplanes to another. I have a feeling I've got my work cut out. when the sale was on view. so this is a bit of a punt. but the auction room is still in full swing. And it seems Kate isn't the only one with a penchant for toy cars. vintage racer with a guide price of £50 to £80. £35, £38, £40, £42, £45. I don't know why I've done that! He was in, he was out, he was shaking it all about. an English Grand Prix car from the late 1950s. Now, this is a model by Tri-ang. Great make. And the thing about toys is that they need to be mint and boxed. Well, it's boxed and it looks pretty mint to me. Our auction room aficionados have survived Round One and spent big. but which dealer will drive into the sunset of ultimate victory? Let's tot up the totals so far. with £1,000 of their own money to spend. for the next three rounds. add to their Showdown haul. he likes the look of. Is 40 euro any good? That's a quick deal, isn't it? on the teak garden set. nifty trick for determining the origin of wooden garden items. -It says here, look. "Made in Indonesia". And that's always a good clue, my friend. Yes, impressive stuff. Nothing gets past the Fox's beady eye. and sticking with his theme of 'things to sit on in the sunshine'. He spots a chair that he'd like to add to his collection. Almost for nothing. 4 euros. and Phil hopes he's sitting on a profit. I guess it's probably 1960s, something like that. It was 4 euros. How can I fail to make a profit on that? And in the meantime, I could always hire it out. spotted some vintage crockery she hopes will make her a crock of cash. This is basically nursery ware. figures of children dressing up. No, no, I don't do this for these things. -OK, so 15. I can do 15. And she thinks the set is mashing. A plate, a bowl and a trio. so I better make sure I do too. Yes, don't go dropping it, old Butterfingers Bliss. It would sit beside a bed. And in this little cupboard below, it would house a chamber pot. Made of oak. Typically Edwardian. But it's not. It's actually very modern. But it has got a good marble top. The best way to maximise my profit is to sell it privately. It might need a little bit of TLC first, though. and both kept their costs down on foreign soil. they sell their items for back in Blighty. for the next two rounds. where they will be pursuing the most profitable plunder. But before the buying begins, our pair have time for a catch-up. -I know, just frightening, isn't it? that I've earmarked for the auction yet. something of quality that is going to do well at auction. Then I think I'm going to follow you. -Well, you are going to have to catch me first. and Phil is first to shine the light on a potential buy. The best I can do on that is 150 quid, if it's any good. -160 and it is yours. I think this is a really cool thing. It is a marriage. it's a surveyor's theodolite or level stand. and put it on here. Really, really wicked. I think it is a cool thing. the next blow, buying this moulded glass grouse for £55. Now, Lalique is a very well-known name associated with glass models. And this is very much a late 20th-century piece. would have been after it first. Hm, Kate is full of fighting talk. But Phil retaliates with his final buy. You put it over your rhubarb and it forces it to grow. There is no great age to this. It is terra-cotta. But it has got this pattern to it. How do you recreate that look? Hm, let's hope Kate's next purchase is something less smelly. -Could I have a look at your little shoe, please? -What is the very best you could do for me on that one? -You couldn't do 40 just for me? I tell you what, we can do a very silly price for you, and that is 41. It looks like a novelty silver shoe. It is in fact made of pewter. It dates from the Georgian period. And it is beautifully crafted. But it is not just a novelty boot. It was actually used as a snuff box. And the lid flips open. I've got high hopes for that one. And with that, Kate's kicked us to the antiques fair finish line. where they stand after Round Three. to Round Four - the Car Boot. for their final profit-finding fling. and brings it down hard on this butcher's block for £100. I've got a real soft spot for butcher's blocks. Both my father and my grandfather, well, they were both butchers. It sort of missed a generation when it got to me. because it says just here - Innsbruck. The bottom, well, I've got to be truthful - it's a bit rough. So I need to do some work there. But I love it. I hope someone else does. and takes a punt with the seller. What's the debt on them? and it produces this lovely glaze on them. They cost me £35 each. And with that, Phil has completed his Showdown haul. His rival has scanned the stalls and seems to have the measure of them. -Oh, yes, I can see. Isn't that a nice one? -This is the case, is it? Oh, isn't that a shame? The top has come off. -I'm actually losing money at 100.
area of the collectors' market. measure, which is a little bit more unusual. And at well over 100 years old, it dates from the Edwardian period. but I still think there is a profit there. but she does have some concerns. The thing about ladles is very often you'd have them in a pair. -And so selling one on its own wouldn't be quite as good. -Can we do business on 30? -If you can do 25 cash, I'll take it away. Now, I knew what this was even from a distance. and was used to measure out an alcoholic tipple. But I also knew that this one is from Scotland. a little thistle, which tells me that it was made in Edinburgh. But it was made over 200 years ago. and should make a profit. So, there we go. They're all bought up. Let's look at the figures. of their own money to spend. what do they make of their wares? -We got all our stuff! -What a relief that is! Today, I am really pleased. I bought a Scottish toddy ladle. which I bought at Ardingly, at the UK fair. And that I am going to put into auction definitely. My favourite thing is my Vanwall motorcar. -What are you putting into auction? -Are you doing a damage limitation exercise? -I bet you are, aren't you? -Is he? I reckon you are. bartering brawn and find private sellers for half their items. where their profit will be at the whim of the bidding public. What goes in is vitally important. So, what are the big plans of attack? Kate is in her kitchen in Herefordshire. Now, my favourite piece is the collection of model toys. And I think these are lovely. I have decided to send into auction. which SHOULD make a profit if there is any justice in the world. I've got a lovely, little 19th-century snuff box. I've got my nursery transfer-printed china. which hasn't got such a strong market over here, in the UK. motifs we have got on this. And then, we've got my Lalique grouse. and now I know is post-1978. but I think there is still room for a profit. pot cupboard, toy fire engine, and Edwardian horse measure. Over at Serrell HQ, Phil's deciding what he's putting into the auction. by Snaffles. I think that is a definite winner for auction. My next auction lot is going to be these barrels here. Now, if you live in the country, who doesn't want to force their rhubarb? So those are three cheapish sort of lots. just a little bit of jeopardy. that is going to be my fourth item in auction. And I think I'm going to put this in. And I think that will do quite well. So those are going to be my four auction items. garden furniture, 1960s chair, and toy racing car. and turn all their talk into antiques selling action. and the money has changed hands, no deal is ever sealed. hoping to bag that crucial opening sale. I'm here at Shelsley Walsh Hill Climb. She is actually a really good friend of mine and a bit of a petrol head. not dissimilar to her racing car. All's fair in love and war...and dealing, it seems! and owes her ten pounds. with racetrack regular Mrs Bryony Serrell? Well, I have brought you something I'm sort of hoping you might like. It doesn't go as fast. No. It is very sweet, actually. -And this little car dates from, what, late '60s, early '70s. -It is cute, isn't it? -What sort of year is yours? you know, looking at this. -What are you thinking on this? anywhere from sort of £20 to £40, something like that. That's rather a lot, isn't it? What about 25, then? Hm-mm. Could I bump you up just a fiver and say 30? -Meet me in the middle, how about that? A nice round figure. -You are against Philip, though, aren't you? -OK, 30. Shall we go 28? as she nets a profit of £18. Go on, put your foot down! She's no Lewis Hamilton, that's for sure! toy car collector Chris in Hereford. It's a mixed start from Kate. But there's no first-night nerves from Foxy. the £161.50 that it owes him. But will theatre director Chris like it? We have action, look at that! -Now, is this of interest to you? I probably wouldn't use it actually as a light, Phil. But I would use it on the stage as a prop. Well, I was hoping I might get 250 for it. 170, 180, something like that. Come on, sharpen your pencil a bit. and he's come over all Thespian. It's to sell, Phil, that's the whole point! who doesn't even let the small matter of no daylight hold her back. And I have come to meet Robert, who is a producer of show horses. Now, I'm hoping to learn a thing or two about my horse measure. so will equine expert Robert think it's worth it? Well, let me show you my measure. This one dates from about 1900. -I've never actually seen one produced like that. I've seen lots of measurements, but not in a case. So, do you think this is something you would like to buy, Robert? -I would've thought so, yes. I was looking for around the £150 to £200 mark. -..and see what you think? -Where are you going to measure him? He's 15 hands and a half an inch, which is perfect for his age. -I think you've asked quite high. But I would bid you 125. Could I say just five pounds more, say 130? in the right HANDS. Ha! time for Phil-Boy to unleash his inner wheeler dealer. # No money back, no guarantee. -I'm very well, Phil, how are you? -Now, can I show you what I've got for you? Let's go have a look then, shall we? -Just a little bit of that oil in them. and they're always saying, "Is there somewhere to sit?" And there are places to sit, as you see, but never enough. So, how old are they? I mean, are they...? -Yes, but they're teak, look, an-teak. -There's an an-teak, and there's an an-teak. I bought these just outside Brussels. And they cost me 50 euros. What I was really hoping for was £20 a chair and I'll give you the table. This isn't going very well, this, is it? £80 isn't going to work, is it? Well, not really, no. I was thinking more about half that, really. No, I don't like the sound of that at all. -I don't like that at all, really. What about if I sold them to you for... I don't know, 60 quid? -..will you take that yellow van out of here? from Boycie, and he's out of there! to dealer Alison in Worcester. to sell privately before the mighty Showdown Auction. Oh, I do like it. Well, I was hoping for around the sort of £100 to £150 mark. I'd be happy with 80.
she planned to sell privately. Well, what a relief, that all came good. it's worth sometimes putting in a little bit of elbow grease. You should try it sometime, Mr Serrell. Well, Phil knows more about axle grease than elbow grease! but Foxy's had to go further afield to Derby with his 1950s racer. And he's revved up with ambition. but also a collection of Formula 1 cars. who I know has got an interest in these. will Kevin give Phil a speedy profit? -Well, I've got to be honest with you. I went to an auction and I did think of you, cos I saw this. ..in the flesh, let alone in its box. I would be interested, yeah. I was hoping to get close to something like 200 quid, if I could. -I would definitely be happy in giving you that for it. -It can go in the display case. and gives Foxy a profit of £87.90. and who's got a flat. a profit of just over £147. bidders at Pump House Auctions, in Hampshire. I sort of feel there is a lot riding on this auction. I'm quite nervous because I've sort of done a worst-case scenario. And if I have a bad day, I'm sort of £100 down the bin, really. the sun's going to shine, positive feeling. -Come on, let's go and have a look. So, our pair have understandably got the jitters. the saleroom's standard selling commission and house fees. there's one last chance to look over each other's lots. she could do all right with that. Katie, my love, I think your grouse has turned into a turkey. That paint looks pretty fresh. It's not a dissimilar colour to my pot cupboard either. He's been pinching my ideas! This is just an absolute steal and I wish I'd seen it. but there's something about these that don't exactly set me on fire. Maybe it's the cushions on top. It's a lovely little Scottish ladle. The only thing is, Kate, we're in Hampshire! a volume of Snaffles that looks like it's been caught in the rain? The first of our items under the hammer is Phil's rhubarb forcer. He paid £35 for it. I don't think you could get many more people in here. Not unless they were swinging from the chandelier. The real question is, how many of them want their rhubarb forced? Couple of bids here. 18. 20. -Got a bidder on the front row. Will you please wipe that smile off your face? Oh, a crushing start for Phil. Phil makes a loss of £15.38. quickly with his upcycled butcher's block, which is up next. I would have this in my kitchen, I like it. 100 there is. 110. 120. I knew that all the time, really. but Phil has a question for the buyer. What would you have gone to? You're a star. Well done, you. Thank you very much. -How come we've missed out on the butcher's block market? I'm going to go see if she's into barrels as well. Well, hopefully she is, Phil, because they're up next. Bid's here. 38. 48 for them. Phil needs bids to reach £90 to be in profit. -I really wouldn't sweat, you're still ahead. of the day - £16.44 after fees. and everything would have been fine. a white-knuckle ride of extreme highs and lows. as her Georgian silver toddy ladle is up next. It's got to make £33. I've got £30. 2 is there. Drop the hammer. Drop the hammer. I've made money. Not a huge amount, but I have made money. but better than a loss! Can she turn a bigger profit with her little glass grouse? and knows what she needs to break even. It's got to make £70, pretty much. I've got 55 for that. losing Kate £9.52 after costs. Her children's tea set is up next. It cost £12.30 in Belgium. Will it do better than the birdie? I think it's got a chance. Couple of bids. 25. I've got 28 for the lot. 30 anywhere? 30, bid 2. 34. And she's got £41 invested. It's got to make just over £50 for me to break even. 38. I've got 40. And I've got 42. 44 there is. 46. 48. -Oh, go on, go on, go on! I think you're sort of unlucky. Phil's last chance at glory lies with his 1930s Snaffles' book. It owes him just over £32. Did you drop it in a puddle? No. We've all seen better days. My prediction is you're going to break even. Couple of bids. I've got 35 and I've got 42. -50 pence profit. I told you! -44 there is. 46. 48. 50 I've got. 2, at 52. Well, that's turned out nicely, hasn't it? Well, fair dues, the boy done good. Well done. -I better go get the teas in. And that's it. There were peaks and troughs, but they survived. We'll reveal the victor in just a moment. Put Your Money Where Your Mouth Is Showdown Champion. Do you know? I got to appear on stage. I sat in a Vanwall. And the best thing is, I made a profit out of Boicey! That's pretty good going, I would say. -You sold something to my wife. -Well, all's fair in love and war. -So how were all your other things? Painted my pot cupboard, that went well. And I got to measure a 15-hand hunter. -Not for me, that would have terrified me. Yeah. But, I mean, for me, the auction was a one-lot wonder. Well, the auction was amazing for you. You had a right flyer, didn't you? -Well, just the one lot. -As butcher's blocks go, it was a nice one. -I'm not quite sure it was THAT nice. -So where are we going to be here? -I know, I really don't know. a week of challenges. So, who is the overall winner? -Well, that was a huge amount of fun. -It was great fun, wasn't it? -And you've been a fantastic partner. -I feel like doing it all again. -But first you can buy me lunch. So a convincing win from Kate. and every penny of that will go to charity. which tackles bullying in all its forms. It's been a week of no-holds-barred combat. from buying and selling antiques when their own money is on the line. Phil Serrell and Kate Bliss race towards the finish line at the showdown auction in Southampton. Having spent £1000 across four different locations, who will come out on top? Phil becomes a proper Del Boy trying to sell to actor John Challis and Kate makes a sneaky sale to Phil's wife!